Read on to learn how to calculate the sample size using this tool, and what do all the variables in the sample size calculation formula mean. Z is the z-score associated with the confidence level you chose. Our statistical significance calculator calculates this value automatically, but if you want to learn how to calculate it by hand, take a look at the instructions of our confidence interval calculator. ME is the margin of error, also known as the confidence interval. It tells you that you can be sure (with probability of confidence level, for example 95%), that the real value doesn't differ from the one that you obtained by more than this percentage. p stands for your initial proportion estimate. For example, if you are conducting a survey among students trying to find out how many of them read more than 5 books last year, you may know a result of a previous survey - 40%. If you have no such estimate, use the conservative value of 50%. n₁ is the required sample size. N is the total population size. n₂ is the size of the sample taken from the whole population that will make your research statistically significant. 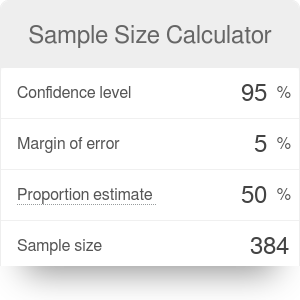 We will analyze a survey case step-by-step so you can get a clear picture of how to use our sample size calculator. You are planning to conduct a survey to find out what is the proportion of students on your campus who regularly eat their lunch at the campus canteen. Decide how accurate you want your result to be. Let's say that it is important for the canteen to know the result with a margin of error of 2% maximum. Decide on your confidence level. We can assume you want to be 99% sure that your result is correct. Do you have an initial proportion guess? Let's say you accessed a similar survey from 10 years ago and the proportion was equal to 30%. You can assume it as your initial estimate. Is the total population of students so high that you can assume it's infinite? Probably not. You need to find the current data for the number of students on the campus - let's assume it is 25,000. Sample Size Calculator can be embedded on your website to enrich the content you wrote and make it easier for your visitors to understand your message.